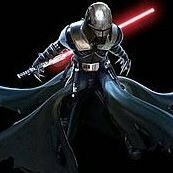 Yeah, it would be foolish to say that there is some sort of established system for sorting as it is sort of by favor of at-the-time DL and LMO, but *GENERALLY* for Sith Lords and DS, if they show up in a movie first, they are in SLD, and if they show up in other media first, they are in TFE. Malgus from Wicked Armor - acceptadble? Great to hear the News, same here finally got the approval. I personally use a red day blade I got from Vader's Vault on all my troops. You don't have to worry about having to light up the saber, and it usually looks better if you are trooping outside in the sunlight. Darth Malgus as a 1st costume, to join the 501st, is not an easy feat, as this is not an easy costume to put on or to wear the whole day at a troop. For the normal person, I would suggest an easier costume to start off with and then to try to make something at this difficulty level. Approval is dependent on your local Czech Republic GMO/GML. You have to attain the right look, compared to official reference materials. If your GML/GMO has any questions with your approval pics, they will submit them to us, and we will give our opinions. The costume in the Video would be approvable yes, but most people in the 501st don't have a "team" to help them get dressed and put on makeup and prosthetic. It is unrealistic to have to show up several hours before the troop to start putting on the costume. Pants, find an official LFL reference to support your look, and you are fine. I have seen black, and I have seen gray, so for the time being, either. Materials for the armor is up to you, but it must look correct. It has to have a thickness to it, it has to look like hard armor. Lights and everything else seen must be included. Find an official reference you are happy with, and make your costume look like the reference. This costume is not an easy one to pull off the correct look. This costume is also quite expensive to pull off the correct look. Not trying to discourage your interests, but many have started this costume and not seen it to the end, and then it was just a waste of time and money, and they never got into the 501st. 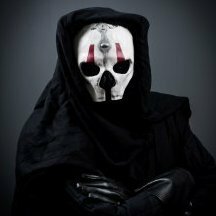 Many have attempted this costume, currently only 2 have an approved Darth Malgus in the 501st! Malgus Silicon mask, is it approvable? I think the mask (yes I watched the video) is way too wrinkled, if you compare it to pics of Malgus he only has a wrinkled forehead and bulging veins on his forehead. That mask is wrinkled every where, whereas the sides of malgus's face are some what smooth (besides the burned area on the left side of his face). Just my opinion, as I am also interested in making this costume in 2018, and since I shave my head anyway, I will be going more the route of makeup rather than mask. If the mask builder could smooth out the face more, I think it would look more like Malgus. Not a big fan of that mask. But that's just my opinion. It will require a ton of prep to keep it glued to your face during troops. And it doesn't let ANY airflow to your skin during those troops. A problem I have encountered during any hot troop. I just uses a sculpted bald cap and a forehead prosthetic to keep in true to Malgus. Again, just my two cents.